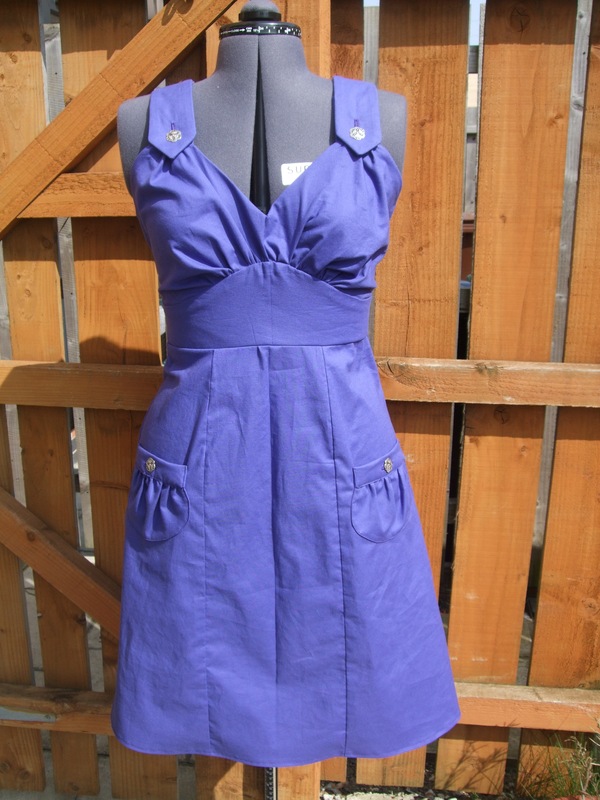 My first version of this dress, made using purple cotton. I was too impatient to iron it before photographing it! The back view, and a close up of the pretty buttons can be found at our flickr site. After Little Tweedie was in bed, Mr Tweedie was otherwise engaged so I did a couple of hours of sewing prep – mainly deciding what to sew next and then tracing and cutting the pattern and some of the fabric. It’s another top – this time New Look 6026 and I’m sewing top B. It was hard to dedicate two hours to sewing today when we all out in the garden enjoying the bank holiday sunshine. However, I stuck to my naptime sewing slot and Mr T got Little T up and kept her amused afterwards so that I could do a two hour block. This pattern is extremely easy to sew, but the worst thing about it is having to turn the tie straps inside out. I couldn’t use my loop turner and it took a good half hour just to turn one. It made me think that next time I’d rather just buy ribbon for the ties instead! Today I was cursing myself for promising to sew over the Easter weekend. It was another beautiful day, and all I wanted was to be out in the garden. I decided to sew during Little Tweedie’s nap as usual and for an hour afterwards like yesterday, but once she got up I really didn’t want to be shut away in my sewing room so I stopped to enjoy a bit of the lovely sunshine. I forced myself to do a further 50 minutes later on, and then I gave up. I’m not going to be too hard on myself though; it’s good to make the most of us all being together at home on a gorgeous day. Think I can finish the top in tomorrow’s sewing slot.